Apteco Ltd is a world class software supplier committed to developing the best marketing data analysis and campaign automation software available. 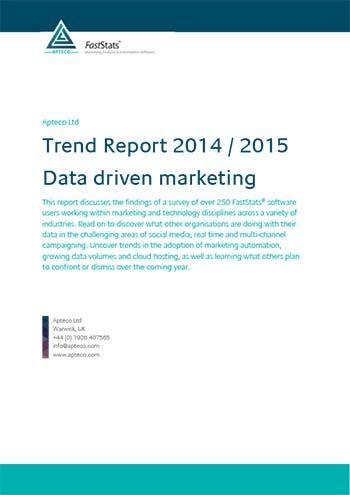 Using the latest visualisation and analytical techniques for customer segmentation, data mining, predictive modelling, profiling, multi-channel campaign management, reporting, and much more, Apteco’s FastStats™ software suite provides marketers with access to the information in their business. With a fast, visual and truly easy to use interface, FastStats enables marketers to gain valuable insight and achieve better targeted, easier to measure and more cost effective marketing. Our prestigious international partner network of marketing services providers has led to over 400 FastStats® systems worldwide and over 3,500 users, including 500 campaign management users across 100 systems.